I never know what to expect, but that's part of the joy and the fun. Even more rewarding is the fact that I get to connect with my fans on this level again. I love posting the videos for you. I really miss this part of our friendship. It's been much too long, hasn't it? So many requests have poured in over the years for examples from you, and it feels good to finally be able to respond. I hope this will quench some of your thirst. Much too much of the footwork you'll see here has been lost. Most of what was recorded was done before High Definition was available. When it did become available, no one thought to take such care to record the feet. That was a tradition long lost by then. Dancing this way brings back a lot of memories, yes, but I also hope it inspires you to dance more as well. One of the primary identifiers of swing dancing, any kind of swing dancing, is the use of footwork. The feet always move more than the upper half of the body. And my feet are a direct reflection of how much training was footwork focused. In ballroom, dancers are encouraged to look one way, stylistically. West Coast Swing is the one dance that emphasizes individuality. Footwork allows for a persons' creative point of view and individual expressions to be seen and realized. Without it, it's very easy for the dance form to devolve into the mindless mush of upper body sways that inhabits Abstract Improvisation. Abstract Improvisation is the dance that results when one community learns from many different teachers who teach vague concepts they've developed themselves. West Coast Swing is the exact opposite. 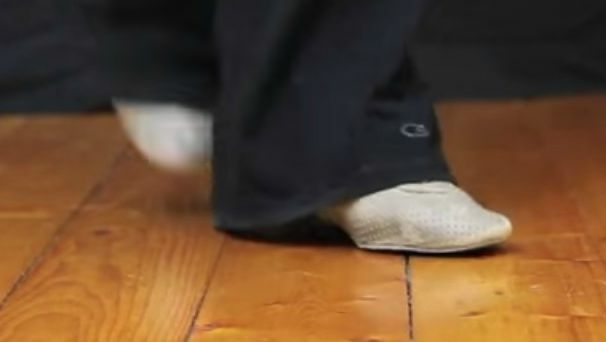 It is the dance that results when one community learns from one or many different teachers who teach the same precise techniques, concepts and footwork. This series will reflect such training, and is proving to be a lot of fun too. I'm always surprised at what my feet do, and in a way, it's like discovering WCS all over again. I hope it brings you just as much joy as it is bringing me. A new Freestyle Footwork video is posted every Monday around 9:30 am PST, and sometimes more! Subscribe to my YouTube Channel today.